A spokesperson said people living outside of the hurricane zone could also be impacted if the item they ordered is coming from an affected area. CHARLOTTE, N.C. - As shoppers seek last-minute supplies ahead of Hurricane Florence, Amazon warns deliveries will be delayed. With hours to go until the monster storm hits the Carolinas, last minute preparation has left some stores with bare shelves and online retailers warning of delivery delays. Many grocery stores and retailers in the greater Charlotte area are limiting the amount of water customers can buy. “I’m hoping for the best and with anything always preparing for the worst,” Shawn Ibara said. Small essential items like food, water, batteries and flashlights have been flying off store shelves as residents brace for days without power. Ibara, who said he lived through hurricanes in Florida, bought 17 gallons of water at Publix in Indian Trail Wednesday night. “[It’s the] only place that had water in the area,” Angela Williams said. "People said Publix had it; so we came directly." One customer shared pictures of a massive stacked display of water bottles in the store to social media to tell friends the store had water available. Download the FREE 11Alive News app to receive breaking alerts and subscribe to our newsletter for email updates. Click here for live radars and updated maps. Others turned online to buy the supplies they needed. 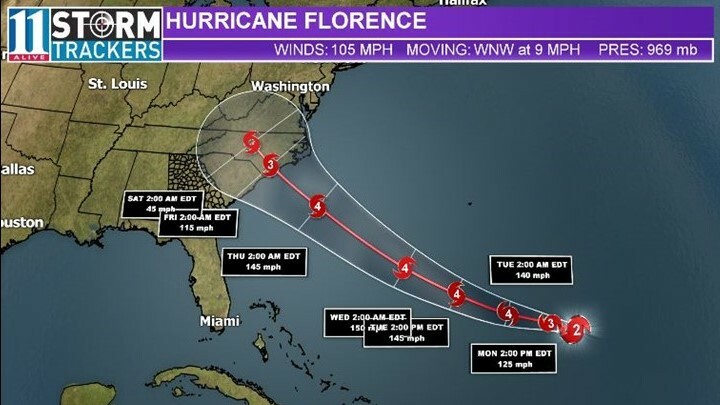 But Amazon is warning customers Florence’s impact could mean customers will not get their orders in time. "Customers living in areas affected by the hurricane may see a delayed delivery promise date on items when they go to checkout,” Amazon said in a statement. Amazon said delivery giants like FedEx and UPS are preparing to ground their crews once the hurricane hits. "Safety of all team members is the top priority as FedEx prepares for and monitors Hurricane Florence,” FedEx said in a statement. A spokesperson for Amazon said people living outside of the hurricane zone could also be impacted if the item they ordered is coming from an affected area.